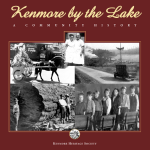 Roads were primitive or nonexistent for early settlers in the Kenmore area. They relied heavily on the waterways and later the railroad to get from place to place. From the late 1800s, however, there always was a wagon road of sorts between Seattle and Bothell, passing through Kenmore. The route wound its way from Eastlake on Lake Union to the north end of Lake Washington as a dirt road, a rut-filled and often impassable route even by horse and wagon. Until the early 1900s, Seattle roads stopped at the edge of the city, near Green Lake. There were few motorcars, and driving anywhere was an adventure. Horseshoe nails and sharp rocks took their toll on automobile tires. When Bothell pioneer and local grocer Gerhard Ericksen became a state legislator, he determined to do something about the road situation. He sponsored the passage of “good road” laws in 1903. 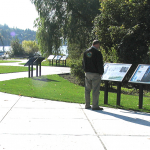 By 1909 the wagon trail from Seattle had been upgraded and surfaced as far as Lake Forest Park with macadam, a durable mixture of asphalt and gravel. First christened Ericksen Road, it later became known as Bothell Boulevard. The rest of the old wagon road to Bothell was graded in 1911-1912. King County began to experiment in 1912 with vitrified bricks from Renton brickyards, seeking a permanent type of paving for the route from Lake Forest Park to Bothell. Trainloads of red bricks were brought from Renton to a Kenmore-area siding near Swamp Creek. Road builders obtained railroad ties from Lake City and cut them in half to help create a narrow-gauge railroad from Lake Forest Park to the Wayne Curve just west of Bothell. This railway was built to distribute bricks along the four miles of road from Lake Forest Park to Bothell. The new road was built largely by immigrant Italian and Greek laborers. All bricks were laid by hand, the workers kneeling to place the bricks, one at a time, and seal them with mortar. Kenmore’s first hotel, the American, served as a bunkhouse for the crews. The hotel was probably on the north side of the railroad tracks (generally east of the present-day Kenmore Pre-Mix site.). The road took the same route traveled by early-day wagons that followed trails around Indian Village (Lake Forest Park) to Squak Slough (Sammamish Slough) and east to Bothell. The road is known to modern-day travelers as Lake City Way inside the Seattle city limits to NE 145th Street, and Bothell Way for the remaining distance. The brick road proved an economic boon to the area. Automobiles replaced horse-and-buggy travel and supplanted the rail lines in popularity. Families took Sunday drives way out to Bothell, and cafes and roadhouses sprang up in Kenmore.